FTC Can Challenge 'Pay For Delay' Generic Drug Deals, Court Rules : The Two-Way The ruling may end the era of what are also called "reverse-payment" deals, in which the maker of a brand-name drug pays a maker of generic drugs to not produce a lower-priced version of their product. The Federal Trade Commission can challenge such deals in court, the justices say. 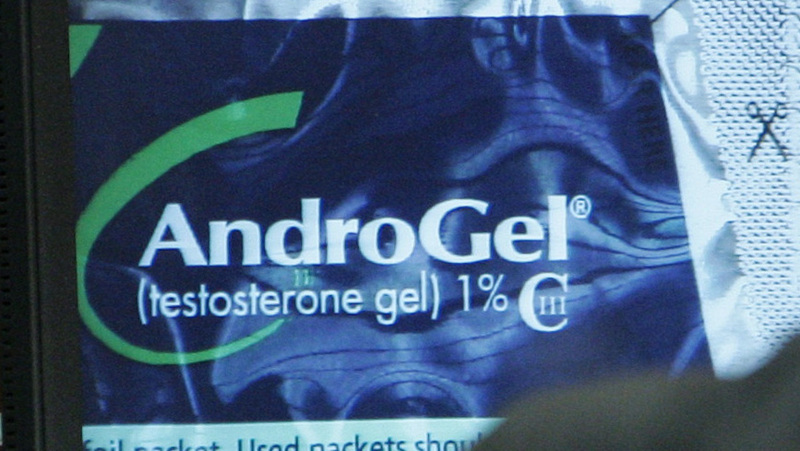 The Supreme Court has ruled that the FTC can challenge arrangements between makers of generic drugs and makers of brand-name products such as AndroGel, seen here on a computer monitor screen. When the maker of a brand-name drug pays a maker of generic drugs to not produce a lower-priced version of their product, the Federal Trade Commission can challenge the arrangement on antitrust grounds, the Supreme Court ruled Monday. The ruling may end the era of what regulators call "pay-for-delay" deals. The justices voted 5-3 to allow a case to go forward in which the FTC is challenging one of many such deals. Several companies are involved in the case, including Solvay Pharmaceuticals, maker of AndroGel, and generic-drug maker Actavis. The arrangement stemmed from an FDA filing by Actavis and another company, in which they asserted a right to produce a generic version of AndroGel. As the FDA was reviewing the case, Solvay sued Actavis to claims of patent infringement. "The FDA eventually approved Actavis' generic product, but instead of bringing its drug to market, Actavis entered into a 'reverse payment' settlement agreement with Solvay, agreeing not to bring its generic to market for a specified number of years and agreeing to promote AndroGel to doctors in exchange for millions of dollars." The FTC then filed suit, claiming the companies had violated antitrust laws, according to court papers, "by unlawfully agreeing to abandon their patent challenges, to refrain from launching their low-cost generic drugs, and to share in Solvay's monopoly profits." The complicated arguments that arose out of the case include the idea that the government generally prefers companies to settle disputes rather than to prolong court cases. Another consideration is the ways in which patents and settlements can each exclude competition. Several federal courts agreed that the FTC's complaint should be dismissed; the Court of Appeals for the Third Circuit did not. The Supreme Court ruled that the FTC could challenge these arrangements, overruling the Court of Appeals for the Eleventh Circuit and sending the case back to a lower court. But the justices did not side with either the FTC or the drug companies on the legality of the "reverse payment" deals themselves. Calling the ruling a "victory" for U.S. consumers, FTC Chairwoman Edith Ramirez said Monday that "the Court has taken a big step toward addressing a problem that has cost Americans $3.5 billion a year in higher drug prices." Voting in the majority were Justices Kennedy, Ginsburg, Sotomayor, and Kagan, along with Justice Breyer, who wrote the court's opinion. Justice Alito was recused from the case. "The majority today departs from the settled approach separating patent and antitrust law, weakens the protections afforded to innovators by patents, frustrates the public policy in favor of settling, and likely undermines the very policy it seeks to promote by forcing generics who step into the litigation ring to do so without the prospect of cash settlements." "The companies involved in the deal the court was examining were brand-name drug maker Solvay Pharmaceuticals Inc, now owned by AbbVie; and generic makers Actavis Inc, previously Watson Pharmaceuticals; Paddock Laboratories Inc, now part of Perrigo Co; and Par Pharmaceutical Cos."
Since at least 2006, several legislators in Congress from both major parties have introduced legislation to outlaw pay-for-play deals. Monday's ruling "is likely to essentially put an end to such payments in the future," writes Kali Borkoski at SCOTUS blog. "Litigation over previous deals will continue in the lower courts." Other observers say that the disposition of those cases will determine whether the practice ends, or if it might continue under different terms.